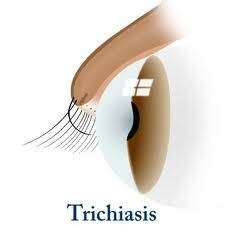 The term trichiasis means abnormal direction of the eye lashes. The abnormal lashes rub against the corneal surface of the eye bass with resultant irritation, watering and potential damage to the cornea. which a mucus graft is placed in an incision in sulcus subtrasalis. 3. Rubbing lashes if more than four are treated by.